31/12/2009 Add new page covering The Soviet SAM System Simulator. Updated Technical Reports APA-TR-2009-0603 (Almaz 5V21/28 / S-200VE Vega / SA-5 Gammon ) with accurate engagement envelope chart, APA-TR-2008-0602 (Warsaw Pact / Russian Air Defence Command Posts) with 5S99E documentation, and APA-TR-2006-1201 (SA-10/20/21 Grumble/Gargoyle) and Design of the S-300P and S-300V Surface-to-Air Missile Systems with new 5N63 images by Miroslav Gyűrösi. 19/12/2009 Add new Technical Report APA-TR-2009-1205-A (Soviet/Russian SAM Site Configuration Part 1: S-25/SA-1, S-75/SA-2, S-125/SA-3 and S-200/SA-5) by Sean O'Connor. 18/12/2009 Updated Technical Report APA-TR-2009-0502 (S-300PMU2 Favorit Self Propelled Air Defence System / SA-20 Gargoyle) with PLA 5P85TE2/BAZ-64022 TEL. 11/12/2009 Add new Technical Report APA-TR-2009-1202 (Russia's Strategic Missile Forces) by Sean O'Connor. 06/12/2009 Add new Technical Report APA-TR-2009-1201 (HQ-9 and HQ-12 SAM System Battery Radars) and new NOTAM entitled FD-2000 / HQ-9 SAM - China's Strategic ‘Game Changer’. 05/12/2009 Updated Technical Report APA-TR-2009-0803 (PLA Cruise Missiles) with CJ-10 analysis by Dr Martin Andrew. 01/12/2009 Updated Technical Report APA-TR-2009-0103 (PLA IADS Radars) with LD-2000 SPAAGM. 29/11/2009 Updated Technical Report APA-TR-2009-0302 (PLA IADS SAMs) with HHQ-9 and other new material; add new Technical Report APA-TR-2009-1103 (CPMIEC HQ-9 / HHQ-9 / FD-2000 / FT-2000 Self Propelled Surface to Air Missile System). Add compendium of Colonel John Boyd's briefings [OODA Loop etc]. This is a mirror of the D-N-I website compendium, courtesy of Dr Chet Richards of D-N-I. 26/11/2009 Add new Technical Report APA-TR-2009-1102 (A Perspective on EW Receiver Design) by John Wise. 22/11/2009 Add new NOTAM entitled F-35 JSF: The Gamekeeper vs the Poachers; updated PLA Air Defence Radars. 21/11/2009 Add new Technical Report APA-TR-2009-1101 (Barrier E bistatic radar) by Miroslav Gyűrösi. 19/11/2009 Add new NOTAM entitled F-35 JSF Program: Assessment of Top Level Programmatic Risks. 17/11/2009 Updated Technical Report APA-TR-2007-0702 (PLA AEW&C) with new imagery generously provided by Zhenguan Studio; updated Quotations and Reflections. 16/11/2009 Updated APA Research page with APA Technical Reports series index table. 15/11/2009 Label and number all technical reports with APA-TR-200N-MMNN series report numbers, and standardise header formatting. Background: in the five years since the APA website was launched, no less than seventy six technical reports have been published on the site. As these are distinct in style and content in comparison with APA Analyses scholarly papers, APA NOTAM articles, and archived industry journal articles, it was necessary to clearly differentiate these publications. Reflecting feedback from visitors, APA recently decided to formally designate all technical report format publications as APA Technical Reports. 13/11/2009 Add new NOTAM entitled F-35 JSF and the SecDef's Nightmare. 11/11/2009 Updated Legacy Air Defence System Upgrades with Technical Note #4; add new NOTAM entitled F-35 JSF: Becoming Your Own Peer Threat . . .While Killing Off the “Best Bang for the Buck” Option - the F-22A Raptor by Peter Goon. Add new NOTAM entitled Mr Secretary - Why Does the Pentagon Say the JSF is a 5th Generation Fighter . . Really? by Peter Goon; updated Quotations and Reflections. Add new page with Quotations and Reflections. 26/09/2009 Updated Sukhoi/KnAAPO Su-35-1/BM/S Flanker, Sukhoi Flankers (KNIRTI SAP-14 and SAP-518 EW pod), Russian ASM and Fulcrum pages with images generously provided by Miroslav Gyűrösi. 22/09/2009 Updated Modern PLA Armoured Vehicles; add new pages covering Advanced Amphibious Assault Vehicle and Type 96 and 99 Main Battle Tanks; updated Sukhoi/KnAAPO Su-35-1/BM/S Flanker , Soviet/Russian Tactical Air to Surface Missiles and Soviet/Russian Guided Bombs with additional material generously provided by Vitaliy Kuzmin. 21/09/2009 Add Defence Today articles: Early Soviet SAM Operations, Regional strategic trends – China’s influence, Fixing the national skills shortage, Cruise missile guidance techniques, Helicopter combat survivability. 20/09/2009 Add new APA reference page by Dr Martin Andrew covering the latest generation of PLA armoured vehicles, entitled Modern PLA Armoured Vehicles. 15/09/2009 Updated PLA IADS SAMs with HQ-16 Gadfly entry. 14/09/2009 Add new APA Analysis paper entitled Assessing the Tikhomirov NIIP L-Band Active Electronically Steered Array and new NOTAM entitled F-35 Joint Strike Fighter vs Russia's New Airborne Counter-Stealth Radars; update PLA IADS SAMs and PLA Point Defence Weapons with new imagery of HQ-9 TEL, FM-90 Crotale and Type 95 SPAAGM; PLA Cruise Missiles with new YJ-62 and CJ-10 TELs. 05/09/2009 Add new APA Analysis monograph entitled The Decline in the Management of Defence and Defence Capability Development, Acquisition, Preparedness, and Sustainment. 28/08/2009 Updated Flanker radar analysis with additional imagery of new Tikhomirov NIIP PAK-FA AESA radar. 25/08/2009 Updated Flanker radar analysis with new Tikhomirov NIIP PAK-FA AESA radar analysis. 24/08/2009 Add to and revise APA home page shortcut buttons. 23/08/2009 Add new page covering Sukhoi/KnAAPO Su-35-1/BM/S Flanker. 22/08/2009 Add new KnAAPO imagery to Soviet/Russian Tactical Air to Surface Missiles and additional data to Soviet/Russian Guided Bombs analysis pages; incremental cleanups. 21/08/2009 Incremental updates and fixes to Soviet Maritime Reconnaissance, Targeting, Strike and Electronic Combat Aircraft, Soviet/Russian Cruise Missiles and Soviet/Russian Tactical Air to Surface Missiles analysis pages. 18/08/2009 Updated Soviet Maritime Reconnaissance, Targeting, Strike and Electronic Combat Aircraft, Soviet/Russian Cruise Missiles, and Soviet/Russian Tactical Air to Surface Missiles analysis pages with additional new content. 17/08/2009 Add new NOTAM entitled F-35 Joint Strike Fighter Program: Collapse is a “When” Question, not an “If” Question by Carlo Kopp and Peter Goon; updated Soviet Maritime Reconnaissance, Targeting, Strike and Electronic Combat Aircraft analysis. 16/08/2009 Add new with additional new content; updated Asia-Pacific-Indian Regional Guided Weapons index. 14/08/2009 Add new PLA Cruise Missiles / PLA Air - Surface Missiles page with additional new content, esp. Silkworm derivatives. 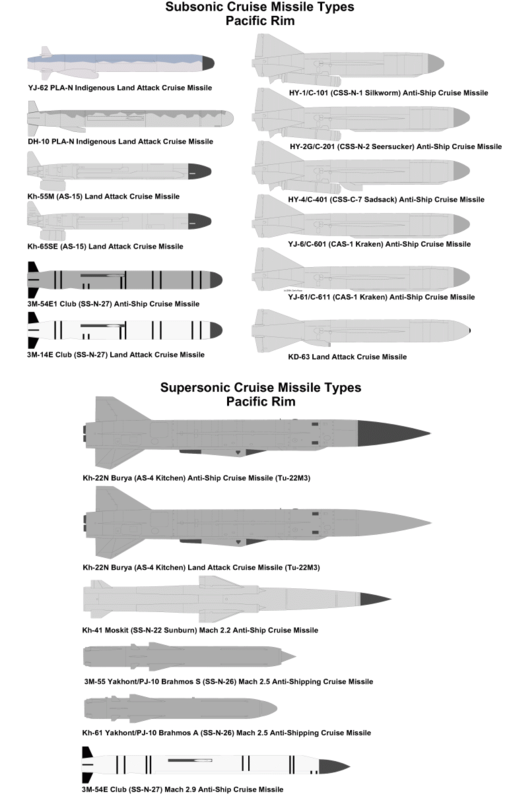 12/08/2009 Add new Soviet/Russian Guided Bombs page with extensive new content. 11/08/2009 Add new Soviet/Russian Cruise Missiles page with extensive new content; updated Russian BVR Air Combat page, SA-13 Gopher upgrades section in upgrades page, and 9K37/9K37M1/9K317 Buk / SA-11/SA-17 Gadfly/Grizzly with new high quality imagery generously provided by Miroslav Gyűrösi. 09/08/2009 Add new PLA Guided Bombs page, images generously provided by Zhenguan Studio. Add new Chengdu J-10A/S Sinocanard and PL-8/PL-11 images. Add new Chengdu J-10B prototype Sinocanard images. Add new high quality imagery of Azovskiy MAK-F IR sensor and 9A34A TELAR generously provided by Miroslav Gyűrösi to SA-13 Gopher upgrades section in upgrades page; updated Fullback, Bear and Backfire reference pages with MAK-UL imagery; updated S-125 / SA-3 Goa page with Low Blow image by Miroslav Gyűrösi. Add new 9K35 Strela 10/10M / SA-13 Gopher page; updated SA-19 Grison page; updated SA-17 Grizzly page; updated SA-3 Goa page; updated SA-13 Gopher upgrades section in upgrades page with Azov MAK-F IR sensor details; new images generously provided by Miroslav Gyűrösi; move 2008 notices to archive page. Add new Asia-Pacific-Indian Regional Guided Weapons index. Updated PLA Tanker page with H-6U imagery and Regional PGM page with ASCM imagery , split and detail C-602, C-701/704, C-801/802/803 cruise missile entries; add new PLA Air to Air Missiles page; all pages updated with images generously provided by Zhenguan Studio. Add Tikhomirov NIIP SA-6 upgrade. Updated PLA Air Defence Radars with LY-60 and HQ-7 radars. Updated PLA Point Defence weapons with imagery generously provided by Zhenguan Studio; add HQ-7/FM-80/FM-90 / CSA-4 Crotale, LY-60 / HQ-64 Aspide, FB-6A “Avenger” SAM System; add new entry for LS-II ADS “PLA SLAMRAAM/Chapparel” SAM System; add imagery to CHETA YJ-62/C-602, KS-1A Kai Shan 1 / HQ-12. Updated Russian / Soviet Point Defence Weapons with 9K31 / SA-9 Gaskin and 9K35 / SA-13 Gopher heatseeking SAMs, plus miscellaneous other fixes. Add new page covering the Tunguska and Pantsir SPAAGM systems; Add new high quality Serbian Low Blow (F-117A killer) images generously provided by Miroslav Gyűrösi. Rebuild and update with new material the S-300V/SA-12 Giant/Gladiator analysis page; add new page covering 9K330/9K331/9K332 Tor M/M1/M2 / SA-15 Gauntlet. Add new page covering 9K37/9K37M1/9K317 Buk / SA-11/SA-17 Gadfly/Grizzly ; declutter radar analysis pages. Add new high quality SA-17 images generously provided by Miroslav Gyűrösi. Add new page covering 9K33 Osa/Romb / SA-8 Gecko; update Land Roll and Pat Hand with new materials; Add new high quality SA-8 images generously provided by Miroslav Gyűrösi. Updated S-125 Neva/Pechora / SA-3 Goa and SNR-125 Low Blow with additional material. Special thanks to Peter Skarus for his helpful advice and inputs and imagery. Add new high quality cutaway images and interior images generously provided by Miroslav Gyűrösi to the 2K12 Kub/Kvadrat / SA-6 Gainful, Legacy Air Defence System Upgrades and 1S91 Straight Flush analyses. Add new page covering 2K12 Kub/Kvadrat / SA-6 Gainful. Add five new briefings covering the future of US air power and NOTAM #46 introducing the briefings. Add new page detailing the S-125 Neva/Pechora / SA-3 Goa; special thanks to Peter Skarus for his helpful advice and inputs, especially on systems, propellants and control laws; declutter SA-3 entries in other pages; add new page detailing the SNR-75M3 Fan Song E Engagement Radar, with images generously provided by Miroslav Gyűrösi; imagery updates to S-75 Volkhov / HQ-2A/B / CSA-1 / SA-2 Guideline and SNR-75 / Fan Song analysis. Add new page detailing the S-75 Volkhov / HQ-2A/B / CSA-1 / SA-2 Guideline; special thanks to Peter Skarus for his helpful advice and inputs, especially on systems, propellants and control laws. The page includes some combat imagery of engagements. Add further material to SNR-75 / Fan Song analysis. Add further material to 5N62 Square Pair analysis; Miscellaneous fixes. Add new S-200VE Vega / SA-5 Gammon page with a considerable amount of new material; declutter SA-5 entries on existing pages; add new SA-2 and SA-3 SAM cutaways to the Engagement and Fire Control Radar page. Add Iraqi 3M9/R-60 Hybrid Heatseeking Gainful Round to legacy SAM upgrades; mirror Dr Ben Lambeth's APJ analysis “Kosovo and the Continuing SEAD Challenge”. Updated ground based counter ISR ECM systems with R-330 family of VHF comjammer systems. Includes images generously provided by Miroslav Gyűrösi; completed index page modifications. Index pages are being currently subjected to a update and layout change to structured tabular formatting. The intent is to simplify access. Some additional links have been added where appropriate. Updated Legacy Air Defence System Upgrades with new material; declutter Legacy TEL/TL and Engagement and Fire Control Radar pages; updated SAM System Index; revise toolbars and home page shortcuts due to high visitation rates to SAM system index page and low visitation rates to Abstracts page - contacts to auxiliary toolbar, new main toolbar button for SAMS/IADS; replace home page SAM system index shortcut button with Legacy Air Defence Systems Upgrades shortcut button, migrate Abstracts links to Navigation page. Add new APA analysis Revisiting the Lessons of Operation Allied Force by Dr Martin Andrew. ; add new page covering Legacy Air Defence System Upgrades - it is intended that existing upgrade material on other pages will be migrated to this page over time. Updated ground based counter ISR ECM systems and Air Defence System Defensive Aids pages with further imagery generously provided by Miroslav Gyűrösi; updated 76N6 Clam Shell page with performance specifications; updated 9A84 S-300V TEL/TL image; updated IADS command posts with new materials; add new Valeria E to Emitter Locating System page. Add new page covering Air Defence System Defensive Aids, covering decoys, MAWS and other countermeasures for radars and SAM systems. Add new page covering Briefings and Submissions; replace upper toolbar FAQ shortcut button with Briefs/Submissions button, FAQ to Contacts page; add new SPN-40 jammer images and SA-10 5P85SE/DE TEL images generously provided by Miroslav Gyűrösi. Add new page covering Proliferation of Advanced Surface to Air Missiles. 31/05/2009 Add new page covering NKMZ 40V6M/40V6MD Universal Mobile Mast; declutter 76N6 Clam Shell page. 30/05/2009 Updated Nebo SVU with further antenna imagery generously provided by Miroslav Gyűrösi. Updated PLA point defence weapons page with new material including the Type 90 SPAAG, Yitian SAM system and FN-16 MANPADS; Add new S-400 Triumf / SA-21 page using existing materials from existing S-300PMU page with updates, depopulate S-400 entry in S-300PMU page. This has been done due to the ongoing and increasing availability of new S-400 materials; further updates to Russian ground based counter ISR ECM systems. 28/05/2009 Updated Nebo SVU with further imagery generously provided by Miroslav Gyűrösi. Updated Nebo SVU with additional imagery generously provided by Miroslav Gyűrösi; add new S-300PMU2 Favorit / SA-20 Gargoyle page with imagery generously provided by Said Aminov of Vestnik PVO; add new page (still under construction) with Russian ground based counter ISR ECM systems. Updated Nebo SVU, Square Pair with additional material. 21/05/2009 Updated Gamma S1 with new high mobility variant. Add new wheeled Buk M2E / SA-17 Grizzly imagery to Engagement and Fire Control Radars page, and Search and Acquisition Radars page. Updated Nebo SVU analysis with parametric comparison against the Nebo M RLM-M VHF band radar. Updated counter VLO radar page with the new Nebo M Mobile Multiband Radar System; this is a significant development both in its capability, and in the associated design of a self-propelled variant of the VHF-band Nebo SVU AESA. Add new APA analysis paper The Decay Of Critical Military Thinking And Writing; With Particular Reference To The RAAF by Air Commodore Ted Bushell (Retd). Updated SA-2 and SA-3 TEL entries; Fan Song and Low Blow entries. 08/04/2009 Add new NOTAM F-22: 187 Raptors is NOT Enough! 06/04/2009 Add new NOTAM JSF F-35 Program: How Many Miles Does an F-35A Go On a Tankful of Gas? Updated PLA Area Defence Missile Systems; updated PLA Mechanised Infantry Division Air Defence Systems / PLA Point Defence Systems; PLA Air Defence Radar pages; add shortcut buttons to home page. 01/04/2009 Due to ongoing problems with quality of service, and server platform performance, APA rehosted the website today to a more powerful server. Unfortunately the short notice involved resulted in an unavoidable outage of several hours. Updated WZ551D, LY-60 and HQ-61 on PLA Mechanised Infantry Division Air Defence Systems / PLA Point Defence Systems page; updated HT-233. 25/03/2009 Updated S-300V/VM TELAR/TEL page. 24/03/2009 Updated S-300V/VM page with additional material on S-300VM and S-300VMK. NB significant aperture increases to the 9S32M/ME engagement radar. 22/03/2009 Add David K. Barton's May, 1994, Microwave Journal analysis Design of the S-300P and S-300V Surface-to-Air Missile Systems with additional imagery; Updated S-300PMU page with additional imagery generously provided by Miroslav Gyűrösi. Updated S-300V/VM page with additional imagery generously provided by Miroslav Gyűrösi. 17/03/2009 Add new page covering PLA Mechanised Infantry Division Air Defence Systems / PLA Point Defence Systems; NB significant counter PGM capability in LD-2000 SPAAGM. Add Defence Today (2008) articles: Future expeditionary warfare challenges; Killing the Vampire / Soviet ASCM development; Milestones: Cruise missiles post World War II; Milestones: Soviet cruise missiles post World War II; High energy laser air defence weapons; NCW in the maritime environment; Russian VHF counter stealth radars proliferate. Formatting changes to APA Analyses page. Rebuild NOTAMs page to ease user access. 04/03/2009 Add new NOTAM When America’s Stealth Monopoly Ends, What's Next? 24/02/2009 Add new NOTAM United Kingdom: F-35 or F-22? 20/02/2009 Add Bill Sweetman's AeroIndia 2009 briefing slides: Fighters In The Long War (PDF 12.6 MB); special thanks to Bill for generously providing this material for posting. Add new NOTAM Will the US Air Force be Annihilated in the Next War? 09/02/2009 Add new NOTAM F-22A Raptors for the Marine Corps. 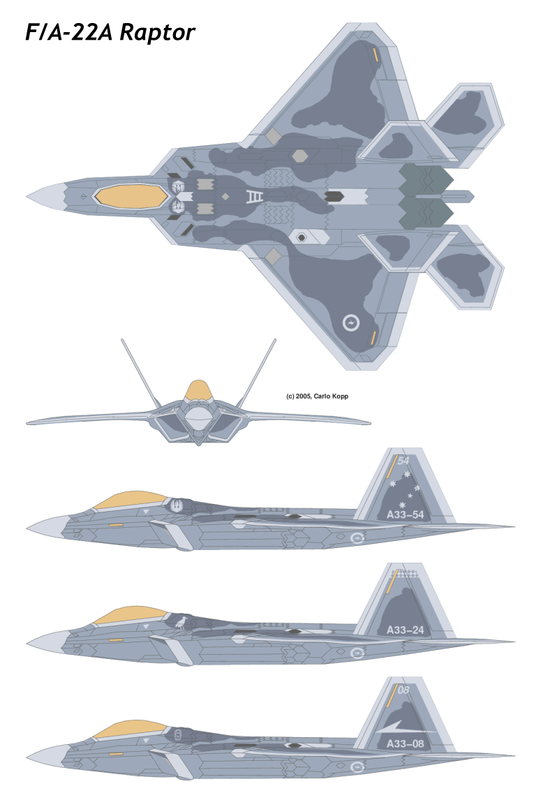 Expand F-22 index page with section on "Why America Needs More F-22 Raptors". Add hotlinks. Add new APA Analysis Surviving the Modern Integrated Air Defence System. Updated SA-8 Gecko with new material generously provided by Miroslav Gyűrösi. Air Power Australia is pleased to announce the release of its first book, entitled NCW101: An Introduction to Network Centric Warfare. Media release. Add new NOTAM Breaking the Kill Chain. Add new NOTAM SAM system hybridisation. 17/01/2009 Updated Surface to Air Missile System Radar Index, Counter Stealth radar pages. Updated PLA Air Defence Radar, Counter Stealth radar pages. Add new reference on PLA Air Defence Radars, excerpted from Chinese Radars by J.C Wise. Updated Gamma DE specs to reflect 2007 VNIIRT data (stow/deploy from 90 minutes to 5 minutes in SP config). Updated/expanded Surface to Air Missile System TEL / Radar Mobility page. Updated/expanded Surface to Air Missile System TEL / Radar Mobility page; updated Engagement and Fire Control Radars page. Add new APA analysis Assessing Joint Strike Fighter Defence Penetration Capabilities; add related NOTAM Coffin Corners for the Joint Strike Fighter; and associated Media Release. Updated/expanded Counter Stealth radar page; S/X-Band Acquisition Radar page; Engagement and Fire Control Radars page. 04/01/2009 Miscellaneous updates and fixes to SAM pages; upgraded Surface to Air Missile System Radar Index and swap title page button. Add new Engagement and Fire Control Radars (S-band, X-Band, Ku/K/Ka-band) to Regional Capabilities page; updated S/X-Band Acquisition Radar page. Add new S/X-Band Acquisition Radar page to Regional Capabilities page. Add Surface to Air Missile System Radar Index to Regional Capabilities page. Finalise updates to Counter Stealth radar page; updated S-300P/S-400 analysis with more recent images, and technical material on missiles and radar. Updated Counter Stealth radar page with additional radars, additional images, additional specs and range vs RCS performance charts. Further updates to come. Add new APA Analysis entitled Rebuilding the Warrior Ethos by AIRCDRE E. J. Bushell AM, RAAF (Retd). Add new analysis - The Impact of Russian High Technology Weapons: Transforming the Strategic Balance in Asia. Updated Emitter Locating Systems analysis, Legacy SAM, and Point Defence SAM support vehicles with additional systems and high quality imagery by Miroslav Gyűrösi. Updated Fullback analysis with new cockpit and EO targeting system details. Added Shenyang J-11B Flanker B page. Updated S-400 analysis with more recent technical material on missiles and radar. Layout modifications to multiple pages. Home page shortcut buttons added for strategy papers and submissions; fixes to National Military Strategy and the Defence 2008 White Paper; miscellaneous fixes. 19/08/2008 Add new missile range animated chart. Add new APA Analysis covering National Military Strategy and the Defence 2008 White Paper. Updated JDAM analysis and produce HTML version of Part 2. 03/08/2008 Add new NOTAM D.I.E.D. in Air Combat; Add more home page shortcut buttons and updated related guided munitions pages. Add new analysis on Theatre Ballistic Missile Defence Systems. Upgraded navigation toolbar tooltips to improve access; sundry fixes to multiple pages. 19/07/2008 Add new analysis Phazotron Zhuk AE/ASE: Assessing Russia's First AESA. Topic index page formatting fixes and text backgrounds added. 15/07/2008 Implement 'high density' shortcut button layout; replace hotlinks on F-22, Flanker, JSF, F/A-18 and Region index pages with shortcut buttons. 14/07/2008 Add more home page shortcut buttons; updated navigation page. 13/07/2008 Further home page modifications for rapid access; updated parliamentary submissions page; updated navigation page. 12/07/2008 Split notices and updates page into current (here) and archived notices pages; add research page toolbar button; other sundry fixes; add new APA Analysis - The RAAF's Professional Mastery Problem: Symptoms, Causes and Measures to Reskill the RAAF by AIRCDRE E. J. Bushell AM, RAAF (Retd) and Dr Carlo Kopp; upgrade banner artwork for HTML pages. 11/07/2008 Add further home page hotlink buttons; revised all header toolbar buttons; revised auxiliary navigation toolbar; split media page into media / news and NOTAM / media release pages. All modifications intended to improve navigation especially for new visitors, and to declutter the legacy media page. 07/07/2008 APA and associates have made three detailed submissions to the Canberra Joint Standing Committee on Foreign Affairs, Defence and Trade of Federal Parliament, Review of the Defence Annual Report 2006-2007. These submissions are now posted at: http://www.aph.gov.au/..../subs.htm; Evidentiary items for Submission #3 remain available at NOTAM #18. 06/07/2008 Add new APA analysis on Eurofighter Typhoon by Dr Kenneth Freeman MBA, MPA. Updated Russian and PLA Legacy Air Defence System Vehicles. Updated Ranets E HPM DEW ie "RF Cannon". Updated S-300V analysis; add new pages covering Air Defence System Support Vehicles. Add nuclear E-bomb primer; add new navigation buttons to index page. 26/06/2008 Add new APA analysis on Russian fighter technology. 25/06/2008 Revised Su-34 Fullback analysis, add new Su-33/33UB Flanker D page. Add Defence Today articles: NCW101 series; GIS/ISR - Fusion on the battlefield; Chemical and Biological Weapons; Knowledge Warfare; Radio frequency spectrum congestion – Emerging headache for NCW; Regional Air Power Developments 2007; Anti-Shipping Missile Survey; The Technology of Improvised Explosive Devices; Origins of the Assault Rifle; Milestones: Early cruise missile operations; Ballistic Missile Operations; Genesis of the Bunker Busting Bomb; Operating the F-22 Raptor - A 1st Fighter Wing USAF Perspective; Pacific Raptors: F-22A based in Alaska; US strategic overstretch and regional impact; Russian fighters –capability assessment; miscellaneous formatting fixes. APA apologises for the 48 hours of site downtime. This was due to technical problems with the ISP's Linux cluster. 09/06/2008 Sundry fixes to multiple pages; updated 76N6 Clam Shell analysis. 08/06/2008 Restructure regional capabilities page indexing structure to simplify navigation; add title page hotlink to regional capabilities page; further updated Regional Precision Guided Munitions page. 07/06/2008 Add Russian Air Defence Command Post page; updated Regional Precision Guided Munitions page; including SS-N-27 GLCM and ALCM, additional imagery including KAB-500SE satellite guided bomb. Updated Tor M2E analysis and S-400 analysis. 03/06/2008 Updated Russian Low Band radar analysis; add Vostok VHF solid state radar analysis. 02/06/2008 Updated/expanded High Energy Laser weapons analysis with PLA analysis. Updated/expanded High Energy Laser weapons analysis. 31/05/2008 Updated APA analysis covering Russian / PLA Point Defence Weapons HEL DEW; Russian / PLA Point Defence Weapons with Ranets E HPM DEW ie "RF Cannon". 30/05/2008 Updated/expanded High Energy Laser weapons analysis - Russian airborne laser testbed. 29/05/2008 RUSI lecture slides now available under NOTAM #23. Updated APA analysis covering Russian / PLA Point Defence Weapons with Ranets E HPM DEW ie "RF Cannon". 20/05/2008 Updated APA analysis covering Russian / PLA Point Defence Weapons with HEL DEW; add additional imagery esp Kupol JSC. Add new APA analysis covering Russian / PLA Point Defence Weapons. 18/05/2008 Updated S-300PMU1/2 and S-400 analysis, including new imagery. 17/05/2008 Add new APA Analysis on JSF Program progress. Add new analysis on Emitter Locating Systems / ELINT Systems; updated Russian Low Band radar analysis with JY-27. Add detailed technical analysis of Russian 1L119 Nebo SVU VHF-band AESA counter-stealth radar. 23/04/2008 Add NOTAM #21 by Col Medved (retd) dealing with Russian counter-stealth technology. 20/04/2008 Add NOTAM #20 by Col Medved (retd) dealing with BVR missile combat. 15/04/2008 Updated Russian Low Band radar analysis; add new images and Nebo SVU VHF AESA analysis. 13/04/2008 Add NOTAM #19 by Col Medved (retd) dealing with radar lethal electronic attack. Add new APA analysis on Flanker Radars in BVR Air Combat. Add new APA analysis on Russian BVR missiles. APA has decided to make public its ministerial submission on fighter matters. The documents are available under NOTAM #18 by Dr Carlo Kopp and Peter Goon. 15/02/2008 Add NOTAM #17 by Peter Goon. Add new APA analysis on RAAF air base hardening issues. Add updated refuelling infrastructure analysis and USAF synfuels analysis. Add F-22A video footage to analysis page. Update F-22A Exercises with table of planned unit assignments. Add new APA Analysis by AIRCDRE Ted Bushell (retd). Add NOTAM #15 by AIRCDRE Ted Bushell (retd), NOTAM #16 by Peter Goon. Updated SDB page with new photos; updated H-6K Badger ALCM carrier with latest imagery. Updated Regional PGM page with new material. 21/11/2007 Add NOTAM #14 by Carlo Kopp. Add NOTAM #13 by WgCdr Chris Mills, RAAF (Retd); update Flanker analysis. Add article on RAAF sustainability by AIRCDRE Garry Bates, RAAF (retd). Add NOTAM #12 and new APA Analysis, both by AIRCDRE Ted Bushell (retd); add 'leading hot topic warning' button to homepage, notices and media pages, this button will point to the most important hot topic at any given time. Add NOTAM #11 and Media Release both concerning the ABC 4 Corners program. Add new Great Debate Correspondence Files section with correspondence to and from Defence and parliamentarians. This section will be progressively updated with further correspondence items over time, as these become available. Updated S-300PMU and S-300V analyses with new material. Updated Flanker analysis with latest Su-35BM brochure link. Add NOTAM #10 by Col Medved (retd); Add Russian Low Band Surveillance Radar analysis; Miscellaneous formatting and other fixes. Add NOTAM #9 by Dr Carlo Kopp. 11/08/2007 Multiple formatting fixes; internal links to CVs. The APA website has been rehosted to a new provider - United States visitors may observe a performance improvement. Clearing browser caches may be advisable over coming days. Website changes implemented during rehosting include a switch from KOI-8R Cyrillic fonts to UTF-8 fonts, and other formatting cleanups. Add NOTAM #8 by Col Medved (retd). Video Footage Supplement; Russian Bombers Video Footage Supplement. Add NOTAM #6 by WgCdr Larard (retd) and NOTAM #7 by AIRCDRE Ted Bushell (retd); additional images Tu-95/142 Bear analysis and Tupolev Tu-22M3 Backfire C analysis. Add new Tu-95/142 Bear analysis; minor updates to Tupolev Tu-22M3 Backfire C andSoviet Maritime Reconnaissance, Targeting, Strike and Electronic Combat Aircraft analyses. 25/07/2007 Add News Archive page for older news report links. 24/07/2007 Add APA NOTAM #5 by AIRCDRE Ted Bushell (retd); title page modifications. UpdatedH-6 Badger analysis; PLA Tanker analysis; MiG-31BM Foxhound analysis; Counter-ISR Weapons analysis; other misc detail fixes. UpdatedSoviet Maritime Reconnaissance, Targeting, Strike and Electronic Combat Aircraft with additional material; updated Soviet Maritime Strike analysis; updated Tupolev Tu-22M3 Backfire C analysis. Updated Soviet Maritime Reconnaissance, Targeting and Strike Aircraft with additional Russian material, esp Tu-16 Badger analysis and EW materials; revised APA NOTAM #4. Updated Soviet Maritime Reconnaissance, Targeting and Strike Aircraft with additional material; Add APA NOTAM #4 by Peter Goon. Update and expand Soviet Maritime Strike analysis; split off imagery section to create Soviet Maritime Reconnaissance, Targeting and Strike Aircraft webpage; updated Tupolev Tu-22M3 Backfire C analysis. 14/07/2007 Add expanded Tupolev Tu-22M3 Backfire C analysis. Add expanded Counter-ISR Weapons analysis. Add APA NOTAM #3 by AIRCDRE Ted Bushell (retd). 08/07/2007 Add expanded PLA AWACS and Tanker analyses; updated H-6 Badger analysis. Add Defence Today articles: DEW Pt.3, NCW 101: Part 9: TCP/IP networking Protocols; Part 10: Satellite Communications in NCW; Part 11: Pseudolites and Stratospheric Relays;Hard Kill Counter-ISR Capabilities Proliferate; The PLA-AF's new force multipliers; Iran - Assessing the Threat; Milestones: Battle of the Beams, Stellar navigation to Satellite navigation; Hitler's Legacy - Modern Islamofascism; NB more NOTAMs coming soon. 04/07/2007 Add APA NOTAM #2 on Flanker capabilities. Add new A330-200MRTT images to AAR/Lift page; updated Super Hornet vs Flanker analysis and Sukhoi Flanker analysis with Irbis-E detection range curves. 29/05/2007 Add 2005 Supercruising Flankers and Cruise Missile Proliferation analyses. Add new APA analysis on MRH90 ship integration. Add new Flanker index page; merge IMINT/MAPs with Strategy index page; update Regional index page; revise APA toolbars; these changes are a result of visitor requests and overwhelming interest in Flanker related materials on APA. Miscellaneous fixes to multiple pages; Google Adsense on all HTML pages. Add Google Adsense on baseline pages. Updated media page; add F-22 ASuW page. Miscellaneous media page fixes; Add media release Facts or Fantasies? Add F-15C and F/A-18A image galleries (special thanks to Michael Tyson); updated APA Flanker analysis radar section. Add new JSF Analysis paper. Add AGM-142E images to F-111 page. Updated Essential Reading on media page. 21/03/2007 Add media release on GAO JSF Report. Henceforth updates to links to articles on media page will not be listed on the notices page. Please check the media page directly. 09/03/2007 Updated links to articles on media page; updated F-22 and SDB pages with SDB test flight image. Updated links to articles on media page. Add Don Middleton paper - ADA Defender - Summer 2006/2007 - Are the F-111s Really Stuffed? 26/02/2007 Updated cost comparison chart on media page. 23/02/2007 Updated links to articles on media page. 16/02/2007 Updated links to articles on media page. Updated F-22A Exercises and Deployments page; links to articles on fighter replacement. Updated H-6 Badger page; F-22A Exercises and Deployments page. Add Northern Edge and other imagery; add McLaughlin F-22 article; add media release on JSF build numbers. Add media release on Super Hornets; add site navigation page; amend title page. New title graphic, add media and history index pages. Updated PLA airbase reference page with additional airfields (Central TVD comparison). Add PLA airbase reference page - includes Google Earth KMZ hotlinks for all airfields listed. Produced updated HTML version of 2004 JSF vs F-105 analysis. Updated Badger page with new artwork and latest H-6K data. Updated PLA-AF/PLA-N Legacy Fighters page, Badger page; added crosslinks. Add new Badger page; add new Chengdu J-10 page; add new PLA-AF/PLA-N Legacy Fighters page, updateRegional Precision Guided Munitions page, Cruise Missile chart; misc cleanups. Update Sukhoi Flanker Analysis and Sukhoi Fullback Analysis with latest imagery. Miscellaneous fixes and detail updates. Add A FAREWELL TO ARMS - REVISITED and Affordability and the new air combat capability to F-111 index page; updated parliamentary debate page with links and recent APA submissions. Add new Small Diameter Bomb page; add new Regional Precision Guided Munitions page. Add revised and heavily expanded Sukhoi Flanker Analysis. Miscellaneous cleanups (Mirrored Articles Page). Updated APA title page to reflect current rather than past APA activities; add research policy page. Relocated topic index page link blocks to new Related Links page (intended to declutter topic index pages). Miscellaneous cleanups. APA Editor Dr Carlo Kopp has published a critique of current planning for the RAAF in The Age newspaper, refer 'Flying into trouble' , 30th December, 2006 issue. Miscellaneous fixes, add images to F-111 page, Mark Kopp aviation art page. Add parliamentary debate page and clean up title pages; add ANAM imagery page. Updated/rehosted Super Hornet flight analysis. Updated S-300PMU/S-400 / SA-10/20 analysis page; S-300V/VM analysis page. The APA website is being moved to a new provider. While every effort has been made to avoid disruptions and loss of service, it is possible that some problems may arise. If you encounter any broken links, corrupted files or other problems, please email the webmaster at carlo@cs.monash.edu.au. Add Mark Kopp aviation art page. Title page LtGen Deptula interview link. Updated F-22A Exercises and Deployments page. Add F-22A Exercises and Deployments page. Warship vulnerability page updated, add WW2 PGMs. Updated title page hotlinks, parliamentary debate links, F-22A designations. Add Smart Tankers, Wedgetail CONOPS, NCW-101 Part 2, SP Artillery. Australian Aviation badges and links removed at the request of the journal editor. Indian AF/Navy Orbat page added. F/A-22A page updated - supersonic JDAM drop. Add Pt.1 Caribou article plus minor fixes. Add F/A-22A analysis, regional missile survey, NCW-101 Part 1, and Turbo Caribou. Add 2002 AAR discussion paper. Add PAG NACC paper, multiple detail updates and fixes. Add new Warship vulnerability page, revise F/A-22A title page, multiple other fixes. Miscellaneous fixes, add archival images to AEW & AWACS, AEW&C, USN analysis, GPS weps, Harpoon/SLAM, Assault Breaker, Cruise Missiles, Laser Guidance, AVQ-26/GBU-15, AGM-130/AGM-136, High Energy Laser weapons, 82WG Ops, Air/Land Battle, add Tomahawk variants page. Add additional archival image material to Assault Breaker, EO systems, Laser Guidance, AMRAAM, Sidewinder, ALARM, RWR/DECM, Penetrator Pt.2, AEW & AWACS, Falklands/Bekaa/AEW, Fighter cockpits, F-15, F-15E, EO Warfare, Heatseeking AAMs, KC-707, GPS Guided Weapons, Harpoon/SLAM, HARM, V-22/JVX, AGM-130/AGM-136, Cruise Missiles, Weasel, MLUs, F-111 upgrades, and ATF . Add new Frequently Asked Questions page. Add new F/A-22A images, update supercruise paper. Legacy articles converted to HTML via OCR - Composites, FBW, F-111 profile, 82WG Ops, AVQ-26/GBU-15. These are the last archival materials. Add F-117A and Fulcrum/Flanker. Legacy articles converted to HTML via OCR - Microprocessors/AI, Bear, MLUs, ASuW/AAW, add Reliability theory slides. Legacy articles converted to HTML via OCR - F-15 and F-15E profiles, USN CV ops, V-22/JVX. Legacy articles converted to HTML via OCR - three part Penetrator series. 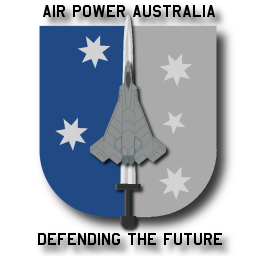 Add AMLCD and LEP/FED display technology primers, update Assault Breaker, add link to Joint Standing Committee on Foreign Affairs, Defence and Trade Inquiry into Australia's Defence Relations with the United States APA submission on cruise missile defence. Legacy articles converted to HTML via OCR - AEW & AWACS and Falklands/Bekaa/AEW. 1995 AF 2025 proposals restored. Legacy articles converted to HTML via OCR - Heatseeking AAMs, Cruise Missiles, Evading Missiles, Soviet Maritime Strike. Legacy articles converted to HTML via OCR - Fighter cockpits, EO systems, Assault Breaker, Stealth and RWR/DECM topics. Legacy articles converted to HTML via OCR - Laser Guidance, High Energy Laser weapons, IFFC, Libya, AGM-130/AGM-136, Harpoon, Radar guided AAMs, Tacjammer and Weasel. Visitors will note that 1980s typesetting errors have been corrected during the restoration process. Given the required time for such restorations, they will appear as future opportunities present. Navigating the APA site - APA has received a request for abstracts to be added to all items. The APA editorial team agrees this is an excellent idea, and an Abstracts page has been added. Miscellaneous detail updates and fixes. Title pages only graphic design upgrade implemented, updated F/A-22A and JSF title pages. Until further notice Dr Carlo Kopp will not be publishing in Australian Aviation. He will continue to publish regular analyses in Asia Pacific Defence Reporter (monthly) and Defence Today (quarterly), and produce occasional items for Air International and other publications.